If you've been reading my blog for a while, you know about the problems we have had with mice getting into our vehicles. The tally in my minivan for the year is seven. That's right. I even took the car into Firestone and asked them to look it over - to see if there was any obvious entrance. They couldn't find anything. I've tried reader suggestions (from all your awesome and helpful comments) but they still keep coming back for more. We've had a seat belt shredded, my headphones ripped in two, and a GPS cord device knawed. I've vacuumed out the car and wiped it down with disinfectant more times in the past 6 months than I can count. And so I thought maybe it was time to adopt a barn cat. Or twenty. Okay, we'll start with one. We went through the Barn Cat Buddies program and if you live in southwestern Virginia I highly recommend you check them out. Low cost adoption, and the animals are sterilized and have their vaccines. Diane, who runs their program is so fantastic and she will happily answer any questions you have about placement. So our whole family headed over to meet a few of the cats last week and we decided on a little timid orange kitty, who had been living in the shelter for almost a year. A lot of the barn cats aren't necessarily friendly, or tame, but they do need a safe place to live where they can happily work as mousers for your family. We brought our little orange kitty home and while she came with the name Radiance, I will probably shorten that to Radley. After all, she kind of reminds me of the reclusive yet watchful and brave Boo Radley from To Kill a Mockingbird. Radley has to stay confined for 3 weeks until she realizes that this is her home. I put her in our bedroom, where it is quiet and she won't be terrorized loved on by the boys. Each day I speak to her softly, and she will allow me to pet her head, but she won't come out of her cubby hole. I brought her out for the first time a week into her stay with us. She was nervous, and camera shy, but she did purr a little when I scratched her chin. I just love her golden eyes. Hopefully Radley will warm up to us a bit. 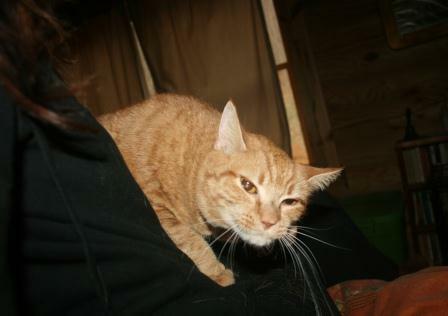 Or at least perk up once she gets to go outdoors, to run around our four shed buildings and hopefully chase mice. She's a sweet girl. Today is Rural Thursday, hosted by Nancy at A Rural Journal and myself. If you have a blog post about the rural life (even if you are not living rurally) come link up with us. We'd love to read about your hiking adventures, your pigeons and your daffodils, your explorations with a camera. Just grab the code below the button and add it to your blog post. Then come back and add your direct link to the post in the linky. Don't forget to go visiting - we'd love for you to hop to at least 5 other folks who link up, and leave them some comment love! I sure hope the cat trick works for you! Radley looks like a very sweet kitty! And yes, you are right- very beautiful eyes! It won't take long and Radley will be so happy going from the barn and sheds. She will think she is in paradise! We have 4 cats that have all been dumped here. We take care of them, and make sure they are safe and fed. Now 2 more wild cats have appeared. All the best with the little orange girl. Whether she turns out to be a mouser or not, Im sure she'll tame up and give your family a lot of joy though hopefully for your sake she will be able to help you with that partiular problem. Congratulations on your newly adopted mouse catcher! That's awesome. I've never heard of somebody having a chronic problem with mice in their vehicles. I wonder why they find it so attractive. Hopefully, Radley can help you out! I love orange tabby's. My favorite pet was one named Sparky. He was a good mouser and used to bring "gifts" from the field behind us frequently. Tough too, got ran over by a car...didn't phase him. Welcome to your new home, Radley! You are beautiful and so lucky to have a home with Lisa. She looks like she is up for a mouse hunt. oh i like the name radley! when we moved to georgia from missouri, we brought our barn cat along...we put him outside and he wandered out to explore and we never saw him again :( we should have just let him stay in missouri because i really think he had a second home somewhere there, he'd disappear for a few days and come home all happy! hope radley takes care of your mouse prob! YAY, Radley! We are counting on you to win the mouser of the year award here in southwestern, VA. Go Radley, Go Radley, Go Radley. Aww, she is a cutie and I'm sure an expert mouse hunter! Radley is cute, I can't wait to get a cat to chase the voles we have. Awww, Livie and I love "butterscotch" cats! I can't wait to show her Radley when she gets home from school. I hope Radley continues to get acclimated to her new home. I wonder if she realizes the big job ahead of her as "Chief Mouser"! Female cats make the best mousers! LOL.... So she is shedding. I guess it is that time of year. i think your on to something, there's more then one way to catch a mouse!! hopefully your sweet new girl will do a great job! our tuxedo is fabulous! Good luck with her! I wish we had a good mouser once again...I sure miss our Violet. Radley is a beautiful girl. I'm glad she now has a permanent home. When Radley gets friendlier, I bet the boys will love her to pieces. Hope it works for the mice, though; that has really been a headache for you guys. I love to hear good adoption stories!!! I'm sure Radley will make a good mouser. She's really pretty! We've had the same problem in the past with mice getting into the old Camrey...John would put traps in the car and catch them...ewwwww! We recently got two feral kitties for the barn...if the dogs would quit pestering them, they could get their jobs done! I didn't realize what that one picture was at first - her hair! That was a lot of hair. We found our squirrel - number 4 - not good news for him. Every rural home needs a good cat or two. I'm glad to hear she's been fixed. Otherwise you'd have as many cats as mice. Congratulations on your new kitty, Radley (cool name) looks like she is a sweetie. I hope she calms down and settles in soon. 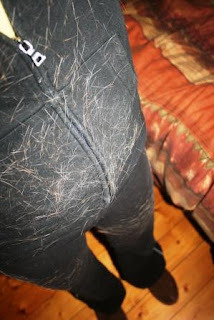 - Yep, cat hair is a problem. We have 6 indoor cats so you can image. Thanks for visiting my blog. I'm glad Radley found such a good home and I hope she helps keep those pesky mice under control! :) I *hate* when they get in the car and die, stinky, stinky! I'm sure she'll be happy and comfortable soon! Congrats on Radley! I hope she grows to love her new home. She's cute! I hope she takes care of your mice problem in your van! I wish we lived closer because my mom has 2 cats living in her house, long story, that I would pay for someone to take! She can't take care of them and she don't need them. Those dang mice aren't going to know what hit em! Welcome to Radley! Hope he's not like my kitty and just plays with them! looks so much like our Ginger...she was a barn cat that found us and was our sweetheart for 16 years until cancer took her. Such a love bug she was. Hey, gotta love cats. And, I do. Thanks for commenting on my cemetery post. I follow through Google Reader. your orange "friend" is so cute. Radley is so pretty! I love, love, love cats. We have two, and they are house cats. I hope Radley feels comfortable soon and helps with the mouse problem.